Full Circle Podcast #5: Manual Dexterity is available now. Some Ubuntu news, a KDE 4.4 review, and, for the first time, we have guests. With Simon Wears talking about MadJam and Benjamin Humphrey about Ubuntu Manual Project.The podcast is in MP3 and OGG formats. File Sizes: OGG 29.5Mb, mp3 21.5Mb; Runtime: 41 minutes 43 seconds. Aqualung is stripped-down music player running on Linux, FreeBSD and Microsoft Windows. It plays audio CDs, streams and audio files. It's nearly always the random-bug-generator sat in front of the keyboard! If you listened to Full Circle Podcast Episode #4, you'll have heard us talk about back-up solutions in response to a listener question. 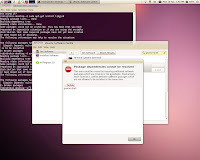 The Beta-2 massive update completed and I decided to go back to the long-promised evaluation of Gnome-shell. So going to Software Center, I selected Gnome-Shell and got the resulting screenshot. In advance of the release of Ubuntu 10.04 Lucid Lynx, we draw your attention to the documentation we've all been waiting for, the Ubuntu Manual.The pre-release draft ('beta') is available for preview. "Getting Started with Ubuntu 10.04 is a complete beginner's manual for Ubuntu, featuring comprehensive guides, How To's and information on anything you need to know after first installing Ubuntu." I am not a KDE user. I made the controversial statement in a previous podcast that if I want to play with fisher-price toys, I would go to Toys-r-us. Surprisingly, nobody roasted me for that. Come on, Kubuntu users, where are you? KDE with its' shiny, primary-coloured icons has never been my thing. That capital K-with-every-program-name obsession always made me feel like I'm in kindergarten. Or should that be K-Indergarten...? We’re back, a little late, with a broken mike AND a vacuum cleaner in back! 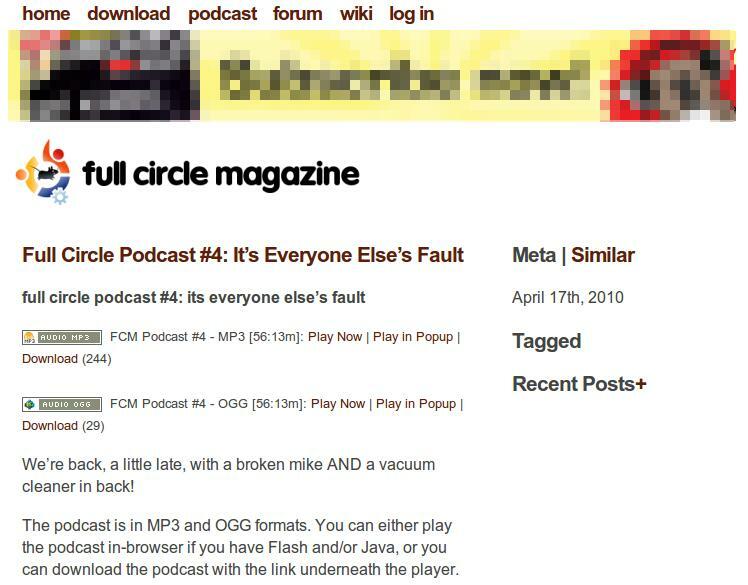 The podcast is in MP3 and OGG formats. Lurking in the System > Administration menu is a useful little tool masquerading under the name of System Tester. Its' real name is Checkbox. "Checkbox provides tests to confirm you system is working properly. Once you are finished runnin the tests, you can view a summary report for your system." 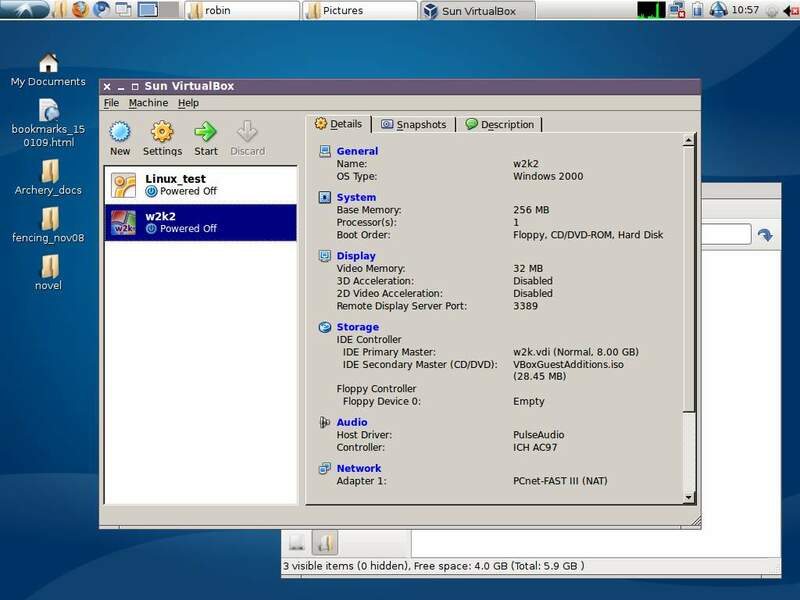 In a set of guided screens, Checkbox runs through a comprehensive set of tests covering all the hardware and most of the software present. The saga is not quite done. If you were struggling to get your Lucid themes set-up and wondering why certain applications ignore the button layout in the New World Order, we can strike one from the snag-list. Yes, I'm talking about the button saga. Window control buttons on the left on all the machines (Gnome and LXDE) for less than a week and only once yesterday did I head to the top-right corner of the screen. I've mixed up minimize/maximize controls twice in three days. Nobody died. I lost no data. Speaking as a creature of habit, I think this says that when we have to, we adapt. If you change platforms and move around machines and operating systems, you can't afford to go to sleep and work your tech on auto-pilot. It's not a great default selection of themes in Lubuntu, but that's easily remedied. You could go to Box-Look.org for extra Openbox themes. 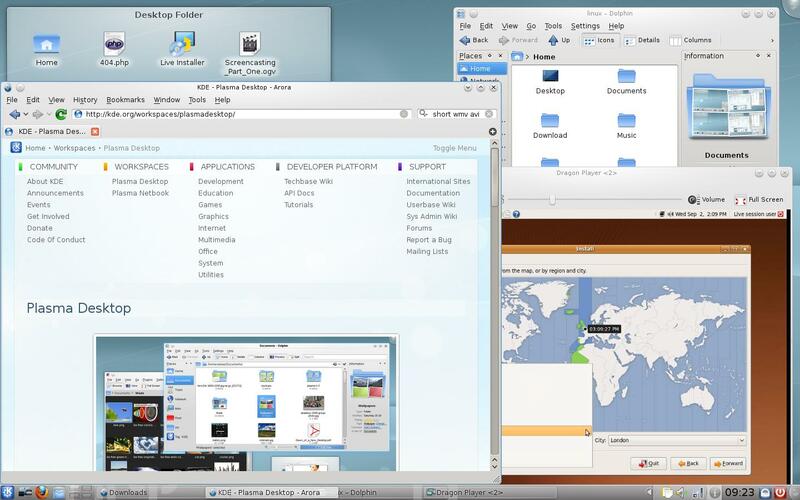 There is a fair selection, although Openbox being a lightweight window manager, it doesn't have the amount of eye-candy that Gnome or KDE have. I did find an early attempt at the Ubuntu Light (Ambience) theme, Ambiance Cold Box by GhostAssassin, which works. Given the dust is settling on the whole left-button right-button debate, I've set my window controls to top-left on the Ubuntu machines (Karmic and Lucid) and thought I'd have a go on Lubuntu, which runs the LXDE desktop using Openbox. There are only two configuration files located in ~/.config/openbox. They are named menu.xml and rc.xml. 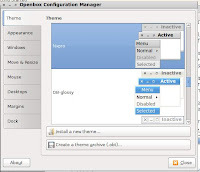 If users do not want to edit them by hand, they can do most of the configuration with an easy-to-use tool called Obconf, a GUI configuration editor for Openbox. 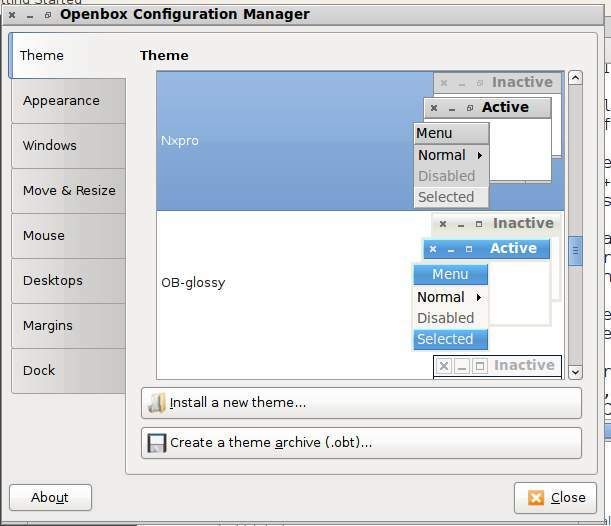 It's available from the right-click menu anywhere on the desktop, as Openbox Configuration Manager. 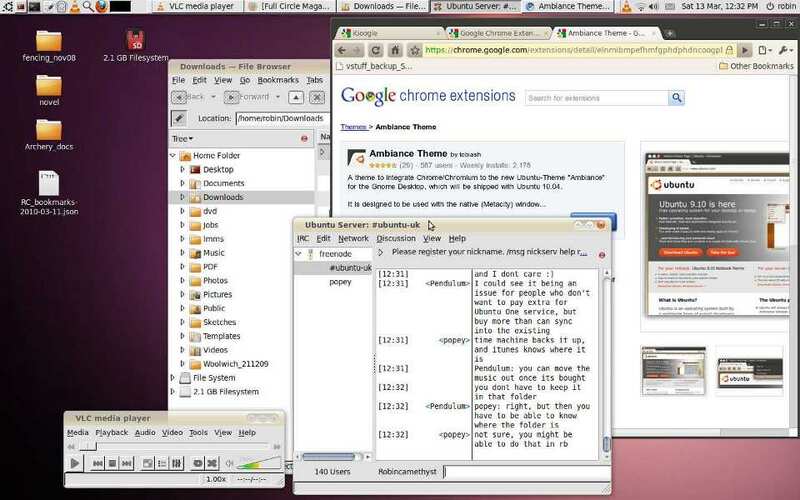 Ubuntu-tweak was always a neat little application to fine-tune your desktop settings. 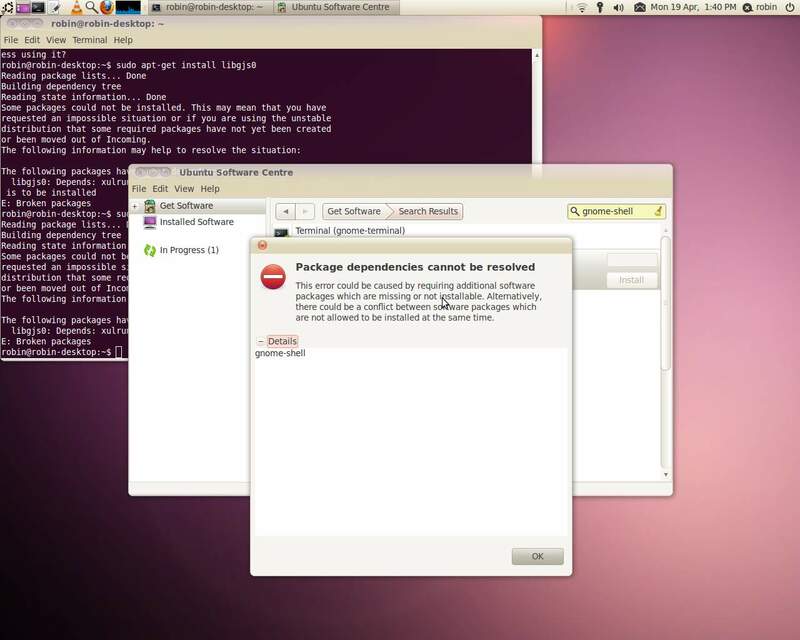 The latest version is now a Swiss-army knife which goes a lot deeper into the guts of Ubuntu. It's not that you can't do all these things by other routes, it's just that Ubuntu-tweak puts them all in one place, without recourse to a terminal session. Enough arguing on the blogs and on launchpad; the window control buttons are staying on the left and that's that. Mark Shuttleworth says so. Mac-haters need not apply. So I've gone for it. My buttons now fasten on the left. I'm getting used to it. I've changed on all the machines... except for the Compaq running Lubuntu. 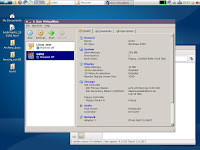 I haven't found if LXDE/Openbox can move buttons.